How do students qualify for the GATE program? The primary identification tool is a Screening Test given each February. Students qualify by scoring at the 95th percentile or better on the National Percentile Ranking (NPR) Total Score. All third graders will be given the GATE screening test in February. Any fourth through eighth grade student nominated and not identified as GATE will take the test at the same time. Students will be tested only once during the school year. If a student does not qualify after taking the test in 3rd grade, he/she can be nominated to take the test once more at the elementary level and once more at Thurston Middle School for a total of three times. Thus, a highly capable student has a total of three opportunities to qualify. In grades 4-8, teachers will nominate students not already identified as GATE who demonstrate extraordinary ability in relationship to their age level peers. Parents of 4th and 5th grade students may discuss student potential for possible GATE identification with their child's teacher; parents of 6th through 8th grade students may discuss possible identification with the school counselor and/or school site GATE coordinator. The teacher and the parent will each complete the Student Behavioral Checklist form and the Teacher/Parent Nomination form. All forms should be completed and sent to the Instructional Services Division to the attention of the Assistant Superintendent. If #1 above is not met and the student received a total score between the 92nd - 94th percentile on the Screening Test, he/she will be administered a Cognitive Assessment by a school psychologist. Results will be reviewed by the GATE Student Study Team during the annual GATE assessment review period. Results of the cognitive assessment will be provided by requesting a meeting with the administering school psychologist. 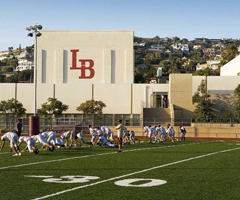 A student who transfers into Laguna Beach Unified School District may enroll in the program if his/her qualifications meet the Laguna Beach Unified School District’s requirements. Parents of new students, upon registration need to submit evidence of GATE identification. All documentation from the previous district will be reviewed by GATE Student Study Team to include site administration, school psychologist, GATE Lead, and other members as determined appropriate. Private testing by a licensed psychologist may be used as evidence for a referral for GATE identification. Parent must submit a complete report for consideration to include tests administered as well as subtest and full scale scores. The district will convene a GATE Students Study Team to review the findings and make a final decision regarding eligibility. Results of the assessments administered are maintained filed in the Instructional Services Office at the District Office. If eligibility is determined, the Office of Instructional Services will request written parent/guardian approval for placement in the Laguna Beach Unified School District’s GATE program. A parent input form will be provided to parents. The qualifying student will also have an opportunity to offer his/her input by completing an inventory that includes an academic and personal self-assessment. These forms will be kept in individual student GATE folders and will be maintained by the GATE cluster teacher at the school site. If ineligibility is determined, the parent/guardian in grades 4-8 will be notified by written communication. All third grade students are given the opportunity to take the GATE screening test. Parents can request score results from their child’s third grade teacher. Only students who qualified for the GATE program will receive written notification from the District.